I can't believe it is summer already! I usually like buying new clothes before the beginning of a new season to "upgrade my wardrobe" but this year I didn't because time flew and it caught me off guard, not only that I have to be realistic and admit that I don't have any more space in my closet. So instead of shopping for new clothes I decided to recycle my old ones making them look different with new accessories and experimenting with my style. No puedo creer que ya sea verano! El tiempo pasó volando y yo ni me di cuenta. 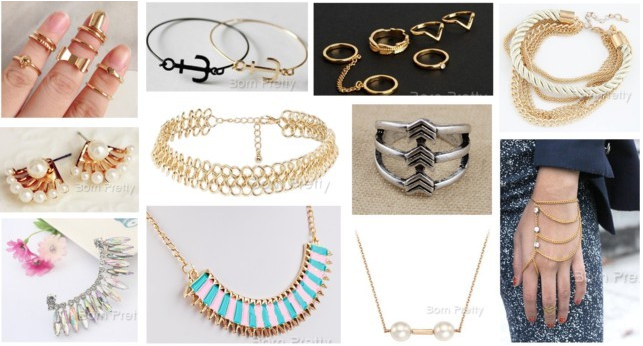 Everything in my wishlist is from Born Pretty, an online store I'm loving right now because they have a lot of cute and affordable accessories (and clothes too). I definitely recommend you to take a look around and fell in love like i did, and don't forget to let me know if you find something cool!!. By the way if you want to buy something use the code: ABT10 at checkout to get a 10% off in your purchase. Todos los accesorios son de Born Pretty Store una tienda online que acabo de descubrir , me encanta porque tiene una gran variedad de accesorios y todo es bastante barato (si comprara mi lista completa no gastaria mas de $35), ademas pueden utilizar el código: ABPT10 para obtener el 10% de descuento en toda la tienda!